Ah, Thomas, the one who has gotten the bad rap all these years. What if we understood Thomas as a believer, rather than a doubter? What if we regard Thomas as one who must have his own experience of the risen Jesus? 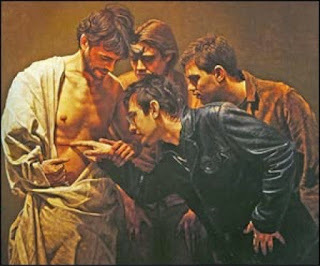 Thomas, who says he must touch the wounds of Jesus, he must see all the gory details resulting from Jesus’ death, and in the end, he doesn’t, in the end, Thomas hears Jesus’ voice and proclaims, “My Lord and my God.” Thomas is for all of us, who will not see Jesus but are invited to believe or encouraged to continue to believe. Thomas must have his own experience of the risen Jesus; Thomas must encounter Jesus on his own terms, so that we, who will not see Jesus, may encounter Jesus ourselves, and believe. This story that we read today, about Thomas and other followers of Jesus, is the third in a series of encounters with Jesus. The first we read on Easter morning, when Mary came to the tomb and saw that the stone had been rolled away. Mary saw what is reported as angels, she explained to them her distress, heard her name, and proclaimed, “I have seen the Lord”. The second and third are these stories today, Jesus appears to his followers and says, “Peace be with you.” Thomas misses all this excitement, so Jesus shows up the next time with the same words, “Peace be with you.” Three encounters with Jesus, three proclamations of belief, all so that we may believe as well. You see, that’s what the gospel writer wants for us. John tells these stories so that we may hear Jesus call us, encounter Jesus, and believe and follow. Mary hears Jesus call her name, Jesus calls to Thomas. Earlier in John’s story Jesus calls to the blind man and to Lazarus. Jesus even calls all the sheep by name. I know something about what that’s like. On hot summer nights, when every kid in the entire neighborhood was out playing kick the can, my mom would yell out the back door, Kathy! and I’d come running. I heard my mother’s voice, and recognized that I wanted to come running into her wide and wonderful and protective embrace. Jesus is like that in this passage we have from John. Jesus calls our names, and we come a runnin. Hear what John is saying to us? Throughout the fourth gospel we hear Jesus call our name, we hear Jesus call to the blind man, we hear Jesus call Lazarus out of the tomb, we hear Jesus call the sheep, we hear Jesus call Mary, and Thomas, and you, and me. We hear Jesus call us into this amazing and abundant love. We hear Jesus call us into an encounter that changes our lives. My mom held the door open wide for me to come running in. Jesus is not just holding the door open for us, but Jesus is the door through which we find love and life. Listen to these words, “the doors of the house where the disciples had met were locked, Jesus came and stood among them. Jesus don’t need no door, Jesus is the door, Jesus is the gate through which the sheep move, Jesus wants to have this relationship, wants us to walk through this door, so that we may believe and follow. Because that’s it, right? This whole experience we have just had, this Holy Week, this suffering and death and resurrection, is all about this relationship, this encounter with Jesus, so that we may believe and follow. So that we may believe, not in some sort of magic, or some sort of rules and regulations, but so that we may believe in the love that wins, the love that knows no bounds, the love that gives itself for us, the love that makes us whole. And this relationship stirs in us the response of following. We are followers of Jesus, we are part of the Jesus movement. This is what the gospel writer John wants for us, to encounter Jesus, to hear Jesus call our names, and to be in relationship with Jesus. And then, follow. In doing so we help to change the world from our nightmare to God’s dream. In these stories the disciples are beginning to comprehend the Incarnation, God who walks this way with us, and they are ready to change the world, even though they don’t know it yet. The energy of God, the Holy Spirit, has been breathed into them. How do you hear Jesus call your name? How does Jesus open the door of your heart and heal it? Because that’s what this is about. It’s not about being a perfect disciple. None of Jesus followers were perfect disciples. Peter, the one who denied Jesus, Judas, the one who betrayed Jesus, Thomas, the one who wants to feel and touch Jesus, Mary, the one who anoints Jesus with the very costly perfume. All of the people who populate these stories are people just like us, people who have at times turned our backs on those who love us, people who at times have succumbed to our addictions and the things that control us. We are people who have been broken by the world’s will and ways. We are the people who are not perfect, and who are loved perfectly by the one who is the door to wholeness and healing. We hear Jesus call our name when we remember who we are. We hear Jesus call our name in the voice of one who says, I know who you are, I know you have been pulled apart, and I love you anyway. We hear the breath of God blow into our hearts and souls, Peace be with you. It is in being put back together again that belief grows. Not in perfection, or having it all together, or even in having it all. Jesus takes on our imperfection, the fragments of our lives, and puts us back together again, rearranges our dust so that we may be whole and healed. And it is possible for us to love again. It is possible for us to love our neighbor. And, like the followers in our story today, the followers who were afraid, confused, disoriented, and sad at loosing their friend, we followers gather together in the confidence that the breath of God inspires us, that in the prayers, and the song, in the bread and the wine, Jesus is in our midst. And like those first followers, we too have to leave that room, we must leave this room, and help change the world from this nightmare to God’s dream. Love God, love one another, show it! Amen.